1500 size 8/0 beads are needed for the beadwork. 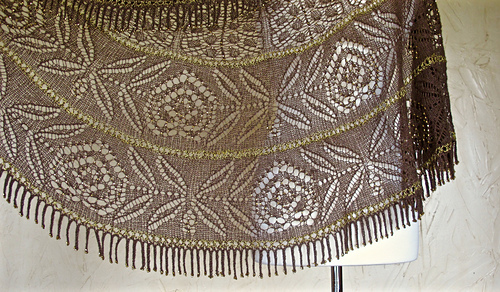 The pattern was first published in the Buffalo Wool Co. E-book Cowgirl Up. This book is no longer available. The pattern is now available from Ravelry. This piece is heavily beaded. The beads in the body are placed with a crochet hook and the beads in the fringe are pre-strung and pulled up as the fringe is worked. This pattern was inspired by the old ballad - Yellow Rose of Texas. And by the combination of Heaven and Strange Twist that arrived mysteriously in my Mailbox one day! 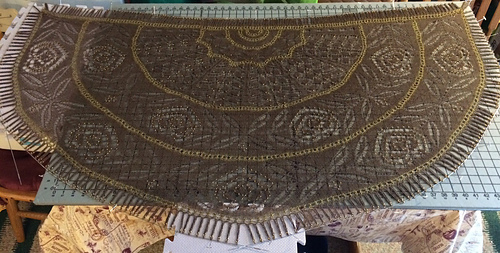 The Rose Chart is one of my favorites and is incredibly beautiful when finished and blocked. 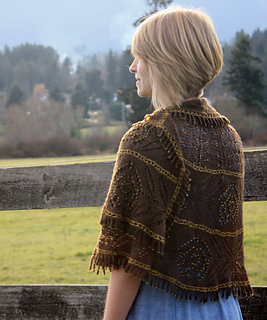 Given the western motif, fringing was the only possible finish - I hope that you enjoy!